I had a whole different post written for today. It was about how during challenging times it’s good to stop and think about what you’re thankful for. It wasn’t a bad post, but the more I thought about all that I’m thankful for, the more I just wanted to stop and praise God for His goodness. For He has been so good!!! Lord, I thank you for all you’ve done for me and all of your blessings. When I think of blessings I think of my family. Thank you for giving me my husband, Tim. He is so wise and caring. He is an amazing father and a patient and loving husband. He is more than I could have asked for, and I thank you for such a precious gift. I thank you for Clayton and Calaiya. Their smiles light my day, and they truly are the greatest joys. Sometimes I get frustrated, but honestly there’s nothing I’d rather be doing than spending time with them. Thank you so much for giving them to me. You didn’t have to, but you did. And while we’re talking about these precious kids, thank you for providing so incredibly for me to stay home with them. Yes, I would’ve stayed home even if it meant we were scrimping by on PB&J and love, but I really can’t believe how much you’ve provided! And it hasn’t just been financially – you’ve also provided a way for me to stay connected to teaching – one of my greatest passions. So thank you for that. You’ve done more than I could’ve asked or even thought. Thank you for extended family and friends who are there for me and encourage me. Thank you that I live in America – a country of freedom and liberty. And of all the gifts you’ve given, I thank you most of all for You. You are the greatest gift – more precious than anything else we could have. Thank you for being so understanding – for loving me even though I don’t deserve it. For being patient with me when I get upset over the stupidest things. For always being there even when I’ve ignored you. And, of course, for giving your life for mine. You are, without a doubt, the best friend in the world. I praise you and I thank you. You truly are the God from whom all blessings flow! 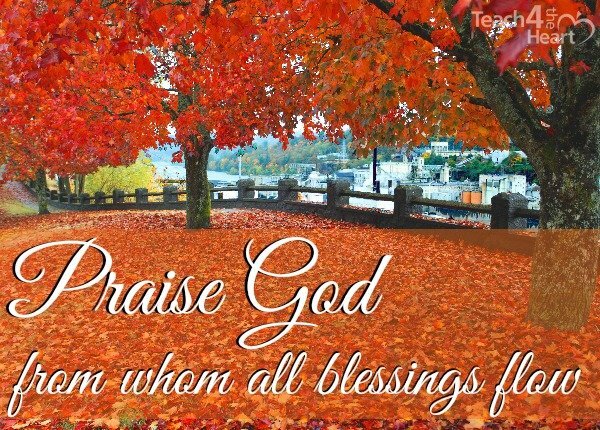 Thank you for this prayer – even though it’s not “Thanksgiving”! You reminded me of all the blessings I have received in my life and so I am thankful for finding your website! Thank you and I am looking forward to many more inspirational messages for both my personal and teaching life! Bless you!